a bad picture. but still…it’s an endangered species. have you ever held an endangered species in the palm of your hand? a first for me. 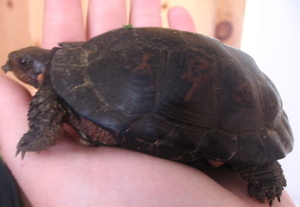 the bog turtle. found in the valley this weekend by an amazing uncle–a walking natural historian. i’m off to the local community college in an hour to visit with a professor and show him my pottery work. i’m trying to get accepted into their workshop program so that i can do my pottery on my own, using their studio supplies and kilns–without having to take all the college-credit courses. i feel that I have a lot of the knowledge from my other art center courses and just need the chance to try things and work things out for myself. but i’m not sure my courses from wisconsin are high enough caliber to ‘get in’ at the college. it’s very nerve-wracking taking your work to someone to inspect, interpret and decide your skill level based upon it. i love my work so far, but I know I have a lot to learn and a lot that I want to try. I just need the chance to get my hands dirty and try new things. The attitude at the college is much different than my arts center. At the art center they were so encouraging of trying new things, seeing what worked, failing, exploring. My instructor there was just happy to see you creating and working and being curious. Here it feels a bit like an audition, but I’m sure if I ‘get in’ it will all go smoothly from there. I hope he doesn’t think I’m some housewife home-potter. Well, I guess I am technically, but I’m not just there for a little fun on Friday nights. I really want to pursue this and try new colors and patterns, objects and techniques. wish me luck. if this doesn’t work out, I may be back in the kiln-buying business. or else making a monthly trek to my aunt’s studio for firing. Good Luck, Molly! Way to go- even just trying for it! That’s how it is to join most printmaking shops. There’s one at UMKC here in Kansas City. I never applied because I was too scared. And now, I’m so out of practice, I’d be terrified to try. All the best. I’m sure you’ll do great. Don’t worry too much about what other people say about your work. Criticism should be listened to with an open mind because you can learn from it. But be confident and trust your work at the same time. After all, who knows your style better than you? oh what a beautiful turtle! wishing you luck. if they know anything you’ll be in!! OH WHERE IS YOUR POTTERY? I do hope that everything went well at your interview today – I do understand your apprehension, as we all have those moments where we feel we’re being judged and what-if-we’re-not-good-enough? It’s not my favorite way to feel…. However, from the glimpses of your work that you’ve shared here, I must say that I, for one, think that you should be a shoo-in and they would be lucky to have you! As far as uniqueness goes, your turtle wins the prize! Oh my dear I send you all my best wishes of the best luck ever !!! And this turtle is so sweet ! Did you keep it at your home ? Endangered species in your hand, amazing! oh molly, good luck with everything! i have my fingers crossed. maybe tell him you have held an endangered species? that might help? I don’t know what to do with it? Just let it go….I can’t believe it is a bog turtle or endangered, possibly his lack of leg makes him a target for a hawk. I am so sensitive and already have become quite attached. Any advice would be GREAT!